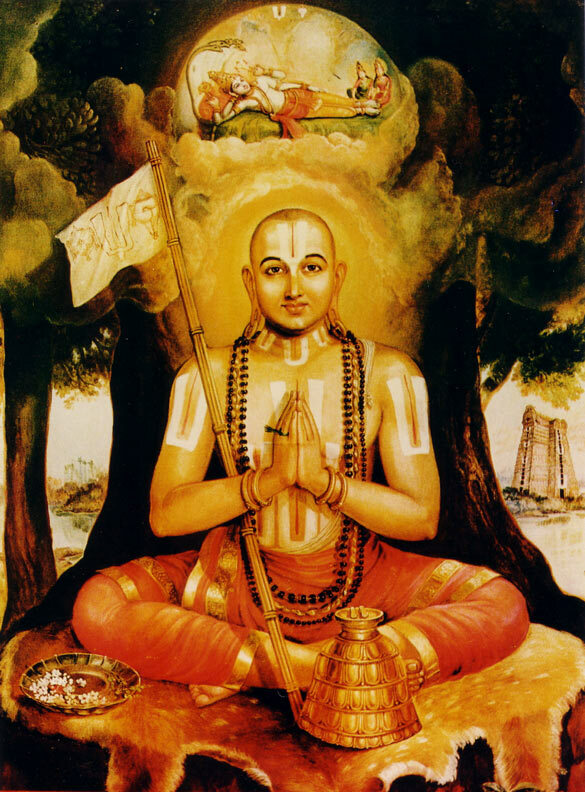 Ramanuja (Tamil: ராமானுஜர், Rāmānujar; traditionally 1017–1137), also known as Ramanujacharya, was a theologian, philosopher, and scriptural exegete. He is seen by Śrī Vaiṣṇavas as the third and most important ācārya (teacher) of their tradition, and by Hindus as the leading expounder of Viśiṣṭā Dvaita, one of the classical interpretations of the dominant Vedanta school of Hindu philosophy. The history of Hindu philosophy and worship cannot be written without reference to Ramanuja, who was the most important proponent of the Vishistadvaita philosophy (qualified dualism), which is one of the 3 main schools of Vedantic philosophy. He was also one of the pioneers of wide spread of devotional worship and was a social reformer too. This influential saint was born in the year 1017, in the village of Perumbudur, about twenty-five miles west of Chennai in Tamil Nadu. His father was Kesava Somayaji and his mother was Kantimathi. Ramanuja's Tamil name was Ilaya Perumal. After his early years he went to the sacred city of Kancheepuram to study the Vedas and Vedanta, under one Yadavaprakasha, a teacher of Advaita philosophy. Ramanuja was a very diligent student he quickly mastered the material he was taught. Yet upon reflection, some of Yadavaprakasha's interpretations of Vedic texts did not quite satisfy him. Ramanuja questioned some of the expositions of his master. Sometimes he suggested alternative interpretations, which were often quite agreeable to many of the co-students. This made Yadavaprakasha very jealous of Ramanuja and subsequently he made a plan to take away the life of Ramanuja. Ramanuja was apprised of the danger to his life by a co-student who happened to be his cousin. Ramanuja escaped with the help of a hunter and his wife whom he accidentally met on the way. About the end of the tenth century, the Visishtadvaita system of philosophy was well established in Southern India and the followers of this system were in charge of important Vaishnavite temples at Kancheepuram, Srirangam, Tirupathi and other important places. The head of the important Vaishnavite institution at Srirangam was Yamunacharya, a great sage and profound scholar. One of Yamunacharya's disciples, by the name Kanchipurna, was serving in the temple at Kancheepuram. Although a Sudra, Kanchipurna was so very pious and good that the people of the place had great respect and reverence for him. At present, there is a temple at Kancheepuram where Kanchipurna's image has been installed and where he is worshipped as a saint. Young Ramanuja came under Kanchipurna's influence and had such reverence for him that he invited him to dinner in his house. Ramanuja's intention was to attend on Kanchipurna and personally serve him at dinner and himself take meals afterwards. Unfortunately, Kanchipurna came to dinner when Ramanuja was not at home, and took his meals being served by Ramanuja's wife. When Ramanuja returned home, he found the house washed and his wife bathing for having served meals to a Sudra! This irritated Ramanuja very much and began to turn him against his wife. After a few incidents of this nature, Ramanuja abandoned the life of a householder and became a renunciate. About this time, Yamunacharya being very old was on the look-out for a young person of good ability and character to take his place as head of the Mutt (institution) at Srirangam. He had already heard of Ramanuja through his disciples and made up his mind to install Ramanuja in his place. He now sent for Ramanuja. By the time Ramanuja reached Srirangam, Yamunacharya was dead. Ramanuja was informed that Yamunacharya, before his death, had left instructions that he had three wishes which Ramanuja was to be requested to fulfil, viz., that a Visishtadvaita Bhashya (commentary) should be written for the Brahma Sutras of Vyasa which hitherto had been taught orally to the disciples of the Visishtadvaita philosophy and that the names of Parasara, the author of Vishnu Purana, and saint Sadagopa should be perpetuated. Ramanuja was deeply touched at the faith that had been placed in him, and in the cremation ground itself, before the dead body of Yamunacharya, he made a solemn promise that, God willing, he would fulfil all the three wishes of Yamunacharya. Ramanuja lived for 120 years, and in the course of his long life, fully redeemed his promise by fulfilling all the three wishes of Yamunacharya. Ramanuja took the position of the head of the Mutt at Srirangam. Ramanuja then proceeded to Thirukottiyur to take initiation from a great mystic by the name of Nambi for Japa (recitation and meditation upon) the sacred Mantra of eight letters Om Namo Narayanaya. Anybody can say a mantra - but the correct technique - the voice modulation and breathing included - are not so easy to grasp. It is the correct technique alone that can serve the greater pupose of the mantra which is to connect the individual with a cosmic energy that the mantra represents and which leads to energisation of the mind and eventual enlightenment. Mantras are traditionally guarded with great care by Gurus, only giving initiation to worthy pupils. While there is some logic to this (prevention of wrong technique becoming popularised), it has tended also to keep away the transformatory benefits of spirituality from many worthy people. Somehow, Nambi was not willing to initiate Ramanuja easily. He made Ramanuja travel all the way from Srirangam to Madurai nearly eighteen times before he made up his mind to initiate him, and that too, only after exacting solemn promises of secrecy. Finally, Nambi duly initiated. But Ramanuja had a very large heart. He was extremely compassionate and his love for humanity was unbounded. He wished that every man should enjoy the eternal bliss of Lord Narayana, such as he had expeienced. He realised that the Mantra was very powerful. He immediately called all people, irrespective of caste and creed, to assemble before the temple, and initiated all comers. Nambi became furious when he heard of this. He chastised Ramanuja. Ramanuja said that perhaps he had done wrong and deserved to be punished - but at least the masses would be benefited. He cared not whether he would be punished or not - provided he could help others. Nambi understood and came to accept his point of view. He embraced Ramanuja and blessed him. By this time, Ramanuja's fame had spread far and wide. He wrote his commentary on the Brahma Sutras known as the Sri Bhashya. The Visishtadvaita system of Vedantic philosophy is an ancient one. It was expounded by Bodhayana in his Vritti, written about 400 B.C. It is this same philosophy that was expounded by Ramanuja; and Ramanuja followed Bodhayana in his interpretations of the Brahma Sutras. Ramanuja's sect of Vaishnavas is called by the name Sri Sampradaya. Ramanuja wrote also three other books—Vedanta Sara (essence of Vedanta), Vedanta Sangraha (a resume of Vedanta) and Vedanta Deepa (the light of Vedanta). Ramanuja travelled throughout the length and breadth of India to disseminate the path of devotion. He visited all the sacred places throughout India including Kashi, Kashmir and Badrinath. Ramanuja then visited all the Vaishnavite shrines in South India and finally reached Srirangam. Here he settled himself permanently and continued his labours of preaching the Visishtadvaita philosophy and writing books. Thousands of people flocked to him everyday to hear his lectures. He cleansed the temples, settled the rituals to be observed in them, and rectified many social evils which had crept into the community. He had a congregation of 700 Sannyasins, 74 dignitaries who held special offices of ministry, and thousands of holy men and women, who revered him as Guru. It should be noted that this number of Sadhus is even greater than most great Hindu institutions today. He inducted lakhs (hundreds of thousands) of people to the path of Bhakti and a highly moral and disciplined life. He gave initiation to all people. He was now seventy years old, but was destined to live many more years, establish more Mutts, construct more temples and spread his teachings to many more thousands of people. Ramanuja like most Hindu saints did not see a contradiction between the one indivisible Supreme Consciousness (usually called Nirguna Brahman or Om) and the existence of God with form and attributes (called Saguna Brahman). According to Ramanuja's teachings, Lord Narayana or Bhagavan is the Supreme Being; the individual soul is a permanent entity; matter is not. Ramanuja regards the attributes as real and permanent, but subject to the control of the ultimate Brahman. The attributes are called Prakaras or modes. Lord Narayana is the Ruler and Lord of the universe. The Jiva is His servant and worshipper. The Jiva should completely surrender himself to the Lord. The oneness of God is quite consistent with the existence of attributes, as the attributes or Shaktis depend upon God for their existence. In standard reviews of classical Hindu philosophy - Ramanuja is always mentioned. He truly was a shaper of the Hindu world. Ramanuja was born Ilaya Perumal in a Hindu family in the village of Perumbudur, Tamil Nadu, India in 1017 CE. His father was Asuri Keshava Somayaji Deekshitar and mother was Kanthimathi in sect of Vadama. To quote from Shyam Ranganathan's article on Ramanuja at the Internet Encyclopedia of Philosophy, "From a young age he is reputed to have displayed a prodigious intellect and liberal attitudes towards caste. At this time he became friendly with a local, saintly Sudra (member of the servile caste) by the name of Kancipurna, whose occupation was to perform services for the local temple idol of the Hindu deity Vishnu. Ramanuja admired Kancipurna's piety and devotion to Vishnu and sought Kancipurna as his guru-much to the horror of Kancipurna who regarded Ramanuja's humility before him as an affront to caste propriety." Shortly after being married in his teenage years, and after his father passed away, Ramanuja and his family moved to the neighboring city of Kancipuram. There Ramanuja found his first formal teacher, Yadavaprakasha, who was an accomplished professor of the form of the Vedanta philosophy that was in vogue at the time-a form of Vedanta that has strong affinities to Shankara's Absolute Idealistic Monism (Advaita Vedanta) but was also close to the Difference-and-non-difference view (Bhedabheda Vedanta). ("Vedanta" means the 'end of the Vedas' and refers to the philosophy expressed in the end portion of the Vedas, also known as the Upanishads, and encoded in the cryptic summary by Badharayana called the Vedanta Sutra or Brahma Sutra. The perennial questions of Vedanta are: what is the nature of Brahman, or the Ultimate, and what is the relationship between the multiplicity of individuals to this Ultimate. Vedanta comprises one of the six orthodox schools of Hindu philosophy.) "
Teach the doctrine of Saranagati (surrender) to God as the means to moksha. Write a Visishtadvaita Bhashya for the Brahma Sutras of Vyasa which had previously been taught orally to the disciples of the Visishtadvaita philosophy. That the names of Paraśara, the author of Vishnu Purana, and saint Śaţhakopa should be perpetuated. Legend goes that on hearing the vow, the three fingers on the corpse straightened. Ramanuja accepted Yamunacharya as his Manasika Acharya and spent 6 months being introduced to Yamunacharya's philosophy by his disciple, Mahapurna although he did not formally join the community for another year. Ramanuja's wife followed very strict brahminical rules of the time and disparaged Mahapurna's wife as being of lower subcaste. Mahapurna and his wife left Srirangam. Ramanuja realized that his life as a householder was interfering with his philosophical pursuit as he and his wife had differing views. He sent her to her parent's house and renounced family and became a sanyasin. Ramanuja started travelling the land, having philosophical debates with the custodians of various Vishnu temples. Many of them, after losing the debates, became his disciples. Ramanuja standardized the liturgy at these temples and increased the standing and the membership of the srivaishnava school of thought. He wrote his books during this time. Ramanuja, who was a Vaishnavite, might have faced threats from some Shaivite Chola rulers who are religiously intolerant . Ramanuja and a few of his followers moved to the Hoysala kingdom of Jain king Bittideva and queen Shantala Devi in Karnataka. Bittideva converted to Srivaishanavism, in some legends after Ramanuja cured his daughter of evil spirits, and took the name Vishnuvardhana meaning "one who grows the sect of Vishnu". However, the queen and many of the ministers remained Jain and the kingdom was known for its tolerance. Ramanuja re-established the liturgy in the Cheluvanarayana temple in Melukote In Mandya District and Vishnuvardhana re-built it and also built other Vishnu temples like Chennakesava temple and Hoysaleswara temple. Ramanuja may have written 9 books. They are also referred to as the nine precious gems, the Navarathnas. His most famous work is known as the Sri Bhasya or Brahma Sutra Bhasya. It is a commentary on the Brahma Sutras. Vaikunta Gadyam describing in great detail Vaikuntha, the realm of Vishnu and recommending meditating on it. Saranagati Gadyam, an imagined dialogue between Ramanuja and Shri (Lakshmi) and Narayana where he petitions Lakshmi to recommend Narayana to give him grace. Narayana and Lakshmi accept his surrender. Vedartha Sangraha (a resume of Vedanta). It sets out Ramanuja’s philosophy, which is theistic (it affirms a morally perfect, omniscient and omnipotent God) and realistic (it affirms the existence and reality of a plurality of qualities, persons and objects). Vedanta Deepa (the light of Vedanta), another appendix/commentary to Sri Bhasya. Ramanuja's thiruvarasu (sacred burial shrine) is the Ramanuja shrine (sannidhi) located inside the Sri Ranganathaswamy temple (periyakoyil or simply koyil) Srirangam, Tamil Nadu within the temple complex, where he attained his Acharyan Thiruvadi (the lotus foot of his Acharya). His mortal remains (thirumeni) have been interred inside the Sri Ramanuja shrine and on top of it his wax look-alike deity (the wax image has been covered with the saffron robes he had used when he was alive) has been consecrated and it is anointed with chandan (sandalwood paste) and saffron (kungumappoo). Another version says the body of Sri Ramanuja is the one which is seen at Srirangam temple today. When closely observed,the nails etc. of the body can be seen. Sandalwood paste and saffron are used to maintain the body and no other chemicals are added .His shrine is open to the general public for dharshan. Ramanuja's achievements are visible to this day. The Tamil prabhandas are chanted at Vishnu temples on par with the Sanskrit vedas. Persons of all communities, and not just Brahmins, are given roles in rituals at Srirangam and other leading temples. The philosophic discources have been passed on to subseaquent generations by great successors like Lokacharya, Vedanta Desika and Manavala Mamuni who lived in the 13th and 14th centuries . The above sloka was first recited by none other than Swami Ranganatha of Srirangam after listening to Mamuni's rendering of the Eedu Muppatharayairam, the celebrated commentary of Nampillai on Nammazhvar's thiruvaimozhi. In this reverential verse the Lord describes Mamuni as His preceptor.